The biggest downside to Boot Camp is that you have to reboot your system in order to use it. That means you've got to save all of your work, close down all of your apps, stop what you've been working on and head on into Windows. While Boot Camp is extremely convenient for those users who are debating the Mac switch but are worried about going cold turkey, in the long run it's only convenient for those who are going to occasionally be switching between the two OSes. Even before Boot Camp, Virtual PC and other PC emulators have existed for Mac users that needed to run Windows. The emulators would generally work in a window inside OS X and you could do things like copy text between the two OSes, but most importantly you could run and use Windows without ever logging out of OS X. The downside of course is that performance under emulators like Virtual PC is often terrible, which makes them frustrating to use, especially on slower laptop hardware. Luckily, modern day Intel CPUs - including the Core Duo used in Intel based Macs - support Intel's Virtualization Technology (VT for short) which is designed to make the job of a virtual machine a bit easier and thus increase performance. 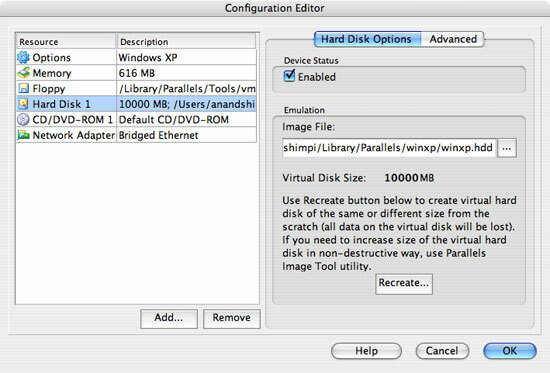 One developer of Virtualization software, Parallels, Inc., has released a beta of Virtualization software for OS X with support for Intel's VT. Parallels' solution offers the first hardware accelerated virtualization software for OS X, meaning in theory you should be able to run Windows XP alongside OS X and get almost the same performance as you would if you were using Boot Camp. Currently Parallels' Workstation 2.1 for Mac OS X is only available as a free trial of Beta 2. It will eventually be sold for $49.99 and you can pre-order it now for $39.99. As a Virtual Machine Manager (VMM), Parallels' Workstation installs from within OS X and doesn't require any reboots or anything like that. You simply install the application and then start configuring your virtual machines. Although I only played with a Windows XP VM, you can run any version of Windows from 3.1 all the way up to 2003 Server, as well as any Linux distribution, FreeBSD, Solaris, OS/2, eComStation or MS-DOS. Parallels' Workstation automatically detects and enables Intel VT support if it's present, so there's nothing MacBook Pro users need to do differently to get the most performance out of the hardware. Creating a Windows XP VM requires just a few decision: how big should the hard drive be, how much memory should be allocated to the VM, and what network controller will the VM use? Make those decisions and configure the VM appropriately, and everything is ready for use. Like my Boot Camp partition, I chose a 10GB drive for the XP VM. 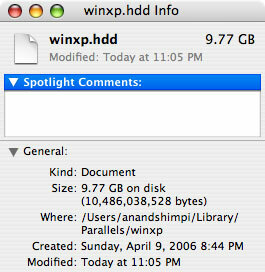 The VM's hard drive is treated as a single file in OS X so you don't need to worry about creating any partitions. 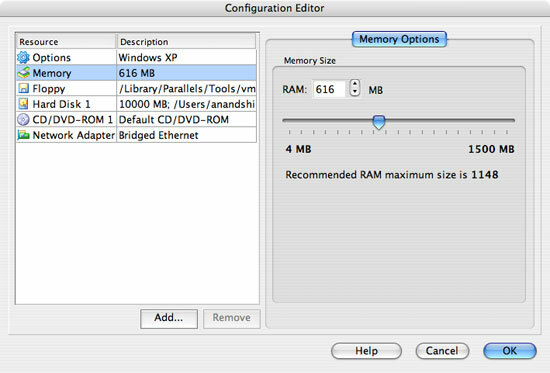 The VM manager recommended I set aside 616MB of memory for Windows XP and for testing purposes I did just that, although if you really plan on using Windows alongside OS X for a lot of work then I would suggest upgrading to 2GB in your MacBook Pro. I allowed the VM to use my wireless connection and it appeared as a normal wired Ethernet connection in Windows XP. All network requests that are sent to that virtual network adapter are handed off to the VM which in turn requests them through the wireless adapter in OS X. However the VM manager only lets you bridge a single network connection, so on the MacBook Pro you can only make either your wired or wireless connection available to your VM. Luckily, it's not difficult at all to change this option so it's not too annoying. Since the Windows XP image was actually on my hard drive the setup process went extremely fast. With Windows installed, it was time to use it. Excellent review, Anand! The Parallels vs Boot Camp comparisons are really well done and very helpful. I thought the comment about PowerBook weight being 1/3 more than any other laptop you've used was a little misleading. I'm sure you didn't mean to say the PowerBook was especially heavy, but since you didn't actually mention what it weighs (5.6 pounds), it could be construed as the Powerbook weighs 1/3 more than other 15.4-inch laptops. I have been looking for 15.4-inch laptops, PC or Mac, that weigh less than 6 pounds with an integrated optical drive. (For me, having the drive integrated is non-negotiable; I wouldn't want to have it in the wrong place when I needed it, so I would be carrying it around regardless, and much better to save the hassle of digging it out and plugging it in when one needs it.) But the Powerbook/MacBook is the only one I have found so far. On the PC side, the VAIO BX and Toshiba Satellite A105 manage to get to 6.0 pounds, but are also are 1.5 inches thick. I'd just like to point out that the buzzing due to power state switching (transitioning between C3 and C4 states) also happens in windows and linux. It's purely a hardware issue, and in most cases it just means the manufacturer used low quality components (capacitors). In windows it is not as noticible because it runs with a kernel frequency of 100Hz. In linux it's often run with 1000Hz. Because of the increase in frequency of power state switching the buzzing becomes audible to the ear. In windows it happens 10 times less than most linux boxes. Hence you don't hear it as much even with low quality components. My own Dell 700m laptop has this issue. The only solution in linux is to disable the lower power states, or change the kernel timer to 100Hz like windows. The best solution is to use dynamic tick switching so you get exactly the responsiveness you need, only when you need it. With a patched linux kernel my laptop automatically goes to 54Hz when idle, and 1000Hz when under load. I found it as a perfect help against the annoying whine. Just start and then stopp it, and you will – if you aren't using ichat – have a perfectly silent macbook till the next reboot. I really think the MacBooks have legs to grow, especially once the intel transition is completed over the next year and universal support becomes more 'universal.' My 12" PowerBook G4 1.5 has served me very well, even with the limitations of XP Pro running in VPC 7 inside Tiger. I think that some of the PC-only enthusiasts who add a MacBook to their arsenal will discover that the integration of excellent hardware esthetic and design with an OS that is continually developing/improving (OSX) will make the Mac solution quite compelling. Great job on the review, it was interesting to see how close things are coming on the software side to run a Windows environment on Macs and pointing out how similar Macs have gotten to every other laptop maker, at least in terms of parts and performance. The thing that gets me now is that the change over to Intel processors and ,in general, a more universal system, has made the Mac just another notebook vendor. So whst the Mac Book Pro has going for it is OS X and any of the Apple software, the machine itself is no better or worse then the many laptop manufacturers putting out Windows based pcs. In the past Macs had sort of mystique relating toa percieved uniqueness. Those who have a powerbook that runds under 1ghz will be well served by the new books NOW. Those that have 1.5 and 1.67 have not need to quickly switch unless there is some native apps including apps free ones they want to use. Those that have no book will do well with them. Waiting unless somthing new was coming out in a couple of weeks is silly. Computers and their prices change constantly, models are refreshed and replaced rapidly. One should always buy what they need and try to future proof too much. Of course those wanting to save might want to wait for the Ibooks err Mac Book.